The Gibson Law Firm helps people with complicated, serious, and routine legal problems. We try to simplify your legal issues. We have been working for the people in upstate South Carolina since 1995. We use our unique ability to apply technology to our cases in a cost-effective manner. We have the technology of larger firms and the personal attention that you expect from a small firm. For specific help and advice regarding your situation, you will need to set up an appointment. The initial consultation is free and most people understand their options much better after the initial consultation. It will be well worth your time. The information on this site is for general information, but there may be significant and important exceptions that apply to your situation, which is why we need to meet personally. If you have a legal question or a legal problem, call for a free consultation. We know you are busy and will do our best work around your schedule. Not All Decisions are final, not all judges get it right the first time. 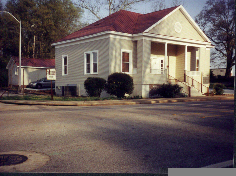 There is one building between the Gibson Law Firm and the Anderson County Public Library on McDuffie Street (same side of the street). Perks Car Wash is on the corner of McDuffie and Greenville Street. It is on the opposite side of the street, a few hundred yards from our office. Perks Car Wash and the Anderson County Museum are on the corner of McDuffie and Greenville Street a few hundred yards from our office.